After ten years as an electrical engineer in Indiana, Randy Butts knew he wanted to be his own boss. Traditional farming tempted him, but he knew that launching a corn or soybean operation from scratch would be a struggle. Friends of his were growing tomatoes using hydroponic farming, a process that intrigued him. Plants grown hydroponically use a small fraction of the water, land, and nutrients that conventionally-grown agriculture requires, and they produce abundantly in a shorter amount of time than conventionally grown vegetables. They can also be grown year-round. After doing some research, Butts decided make a move. Pricing equipment on eBay one day, Butts put in a bid on a greenhouse in Ohio, not expecting to win. “I spent five weekends in 2005 dismantling that greenhouse, moving it back to Indiana in pieces,” he recalls. His family and friends’ reaction? “They pretty much thought I was nuts,” he says. And so Eden Farms, Inc. was born. In 2006, Butts erected the 5,000 square foot greenhouse, planning to grow basil on his property near Lebanon, Indiana, just northwest of Indianapolis. 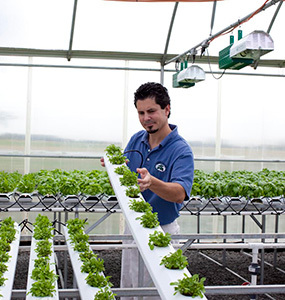 He was not only new to hydroponics, but to sustainable farming as well. In Butts’ opinion, the hydroponic systems at Eden Farms have an advantage over field grown crops, especially when it comes to water and nutrient use. Eden Farms turned a profit after nine months of providing hydroponic produce to groceries, restaurants, and distributors in the region around central Indiana. The company expanded two years ago—but not without a few challenges along the way. The first challenge occurred when Butts found that limiting his business to only one crop could be precarious for his bottom line. “We planted basil to start with,” he says. “Then we had a hiccup with one fairly large customer, and I realized that we needed to diversify our crops.” So he added watercress and arugula, which, along with basil, thrive in hydroponic environments. Staying local is important to Butts and to his customers—especially restaurant chefs seeking fresh, local greens. “We try to supply customers within a 2-3 hour radius of our two locations,” he says, noting that transporting tender crops such as basil while maintaining fresh quality can be difficult. The company has its own refrigerated truck for delivering directly to customers. Some of the customers include two Whole Foods supermarket locations, restaurants and caterers in Indianapolis and Lafayette, Indiana, and distributors such as Indianapolis Fruit, Piazza Produce, Crosset Company and Caito foods. Butts is contemplating expanding Eden Farms to Indianapolis in 5-10 years.